China says U.S. surveillance ship conducted activities in a "special economic zone"
China demands U.S. take measures "to prevent similar acts from happening"
BEIJING, China (CNN) -- A U.S. surveillance ship violated Chinese and international laws during patrols more than 100 miles (160 kilometers) off the Chinese coast over the weekend, China's state-run media reported Tuesday. 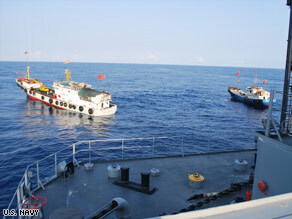 The Navy says this photo shows two Chinese trawlers forcing the Impeccable to make an emergency stop. "China has lodged serious representations with the United States, as the USNS Impeccable conducted activities in China's special economic zone in the South China Sea," said Ma Zhaoxu, a Chinese Foreign Ministry spokesman. "We demand that the United States put an immediate stop to related activities and take effective measures to prevent similar acts from happening." The response follows the Pentagon's contention Monday that Chinese ships harassed the U.S. vessel on Sunday in the latest of several instances of "increasingly aggressive conduct" in the past week. During the incident, five Chinese vessels "shadowed and aggressively maneuvered in dangerously close proximity to USNS Impeccable, in an apparent coordinated effort to harass the U.S. ocean surveillance ship while it was conducting routine operations in international waters," the Pentagon said in a statement. Ma said that "the U.S. claims are gravely in contravention of the facts and confuse black and white and they are totally unacceptable to China," although he didn't say what China's version of the events were. According to the Pentagon, the Chinese crew members aboard the vessels, two of which were within 50 feet, waved Chinese flags and told the U.S. ship to leave the area. He said the Chinese crew members used poles to try to snag the Impeccable's acoustic equipment in the water. The Impeccable's crew members are primarily civilians, and the ship is not armed, the spokesman said. The Chinese ships involved included a navy intelligence collection ship, a Bureau of Maritime Fisheries patrol vessel, a State Oceanographic Administration patrol vessel and two small Chinese-flagged trawlers, the statement said. The Pentagon cited three previous instances of what it described as harassment, the first of which occurred last Wednesday. CNN's Yuli Yang contributed to this report from Beijing.